How can you not have your life blown apart by a brain tumor? We're back in Abilene. I'm glad to be home. Jack did extremely well during his MRI last evening. Never moved an inch! We felt your prayers each step of the way. This morning we had his clinic visit and were able to talk with Jack's oncologist, his neurosurgeon whom we haven't seen in over a year, and a new neurologist that we hadn't met until today. It was one stop shopping! We just sat in a room, and one after another, the doctors came to see us. The report of the MRI was that there seemed to be a small bit of growth on one of the areas they were watching. They measured it for us and it was exactly 2 millimeters larger than the last time they measured it. The many doctors on the team, including those listed above and a couple more, have looked at Jack's scans and felt it necessary to move his next MRI up one month to the first of January then re-scan and see what the results look like. If those results are in line with the results from last nights MRI, then Jack will be starting a new treatment. Most likely a different form of chemo, but no specifics were talked about today. Dr. Price, Jack's neurosurgeon, said that every time there is any change and additional treatments are needed, it is always between chemo, radiation, or surgery. The team involved looks at all the pros and cons and decides what is the next step. The area that is growing is on Jack's brain stem. It is on the outside, so many options are ahead of us. When Jack had his resection surgery in April of 2005, this is the area that Dr. Price tried to get at. She removed a baseball-sized tumor leaving only this little minuscule area we deal with now. Jack's body would not tolerate the last bit being removed as it was interwoven inside his brain stem. You might wonder why they don't start treatment right now. Dr. Bowers said that the area of growth is so small that there is no immediate necessity of treatment until they can confirm with Jack's next MRI that there is consistent growth. They want to make sure that Jack doesn't needlessly get put through another round of something unless it is necessary. 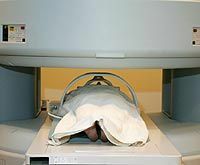 The chemo and radiation bring with it risks of future cancers being developed because of the treatment, so treatment options are not taken lightly. We have an awesome team of pediatric doctors who are at the top of their profession and not one felt like this was life threatening for Jack at this point. We are very lucky that this is benign and not malignant. I was thinking on the way home just how I felt about this. Was I going to worry about it? No. Was I going to worry about it? Then I thought that this really is just more of an inconvenience than it is a tragedy. And then the Lord convicted me this is not an inconvenience. There is road to walk, people to meet, smile's to share, and, most of all, Jesus to be shared with others walking down their own tough roads. This is not an inconvenience, it is an opportunity to live life to the fullest and share the Lord. Thank you, Jesus. "The Real Tragedy" by Tammy Marcelain is licensed under a Creative Commons License. Heartlight encourages you to share this material with others in church bulletins, personal emails, and other non-commercial uses. Please see our Usage Guidelines for more information.